Cadden & Fuller LLP is a mid-sized Irvine based law firm emphasizing business law and civil litigation. Our lawyers have distinguished themselves both educationally and professionally making it possible for them to provide our clients with the highest quality legal services available. Our commitment to customer service, cost effective legal services and up-to-date technology make Cadden & Fuller LLP the best choice to serve your legal needs. 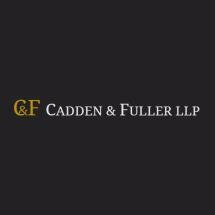 Cadden & Fuller LLP is serious about putting the interests of our clients first. We give our clients straight talk, hard work and responsive communication. We also provide our clients with financial forecasts, budgets and fees-to-date reports regarding our services. With our reasonable rates, we are confident that our fees will be less than those charged by other law firms. The attorneys at Cadden & Fuller work together in teams. This means that you are not dependent on one attorney for answers to your questions. If your primary contact is not in the office when you call, one of the other team members will be there to assist you. In addition, our team approach saves you money. Our younger lawyers, working under the supervision of managing attorneys, are often able to provide their services at a lower cost than a partner or more senior associate. We excel in making technology work for our clients. Our office contains state-of-the-art equipment including a complete federal and 50 state electronic law library, voice-activated voice mail system, e-mail and telefaxes. This technology allows our firm to provide thorough, prompt, high quality and cost-effective legal services. The attorneys at Cadden & Fuller LLP have vast experience and unsurpassed skills. When legal matters arise, we have the answers you need.